To enter, individuals must, during the competition period, visit www.mindfood.com follow the prompts on the competition entry page, input the requested details including the answer in 25 words or less to the following question “Why would you like to see ‘All is True’?”and submit the fully completed entry form. Competition commences on 05/04/2019 AEST. Entries close 10pm on 05/05/2019 AEST. The judging will take place at McHugh Media Australia Pty Ltd, 102/4-14 Buckingham Street Surry Hills NSW 2010 on 22/05/2019 by 12pm AEST. Winners will be notified by email. The Promoter’s decision is final and no correspondence will be entered into. 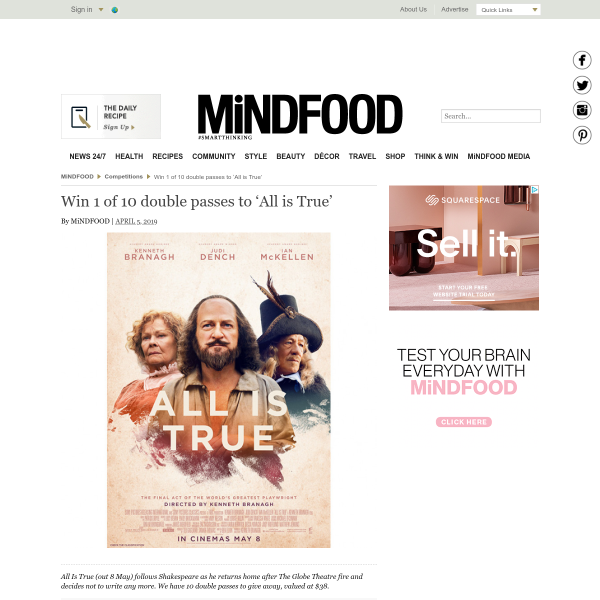 The Promoter has ten double passes to ‘All is True’ to give away, valued at $38.